Well this will be a short and sweet recipe post. Over the weekend, I developed what I thought was just irrated gums from wedging food between the teeth. Nope, as luck would have it, I started my vacation with an abcess tooth. Came out of nowhere. Funny, I go to the dentist for cleaning every three months just had xrays, no problem. Then this. So, I made some foods over the weekend, just in case I wasn't going to feel up to cooking and it's a good thing I did. This is one that you can eat heated up and it still tastes great! Tuesday was my dreaded appointment. I haven't had good luck with teeth, have had great Dentists, but not at all a fan of Dentists all through my childhood and adult years. Being born in the 50's fluoride wasn't something we had much of, my teeth ended up not the best in shape. My kids teeth, thank god are perfect! So in I went to see what the problem was hopeful it wasn't anything but a filling. Then the bad news came from the Dentist, another dreaded root canal. I have already had four root canals in the past, three teeth ended up getting pulled shortly after them all, just wouldn't heal right. I can tell you one thing, for me Dentists are one of my biggest fears, I am sure you already got that message. Uncomfortable is just the tip of this iceberg, phobia I guess is the real word, but with some traumatic experiences from my past that would take pages to write, we will leave it to this one. Anyway, today was the big day for this dreaded root canal. Didn't sleep last night one wink. Got there at 10am, they numbed me, 20 minutes later, I was not getting numb yet. This went on for another 20 minutes and 14 shots later . Nope not numb. So, the next alternative was to have a shot directly into the nerve, yep that's what I said directly into the nerve. All I can say is, I hope you never go through this, I have a high tolerance for pain, but I can tell you one thing I would rather have had another baby any day of the week. The good news is, it numbed me, they proceeded on with this, and another bad memory etched in my mind of things not going smoothly has been born! So, I guess I wrote this part to tell everyone, this is why I am not posting and showing a long well thought out recipe. You will have to bear with me a few days. So, there you have it, my dreaded root canal story. But hopefully this tooth will be saved this time, I still have to hope for that.....so for the next few days, nothing but soft easy foods for me. So, I have a few posting saved up from previous days of cooking, since I deep down inside knew what was coming....... Hope you like the pictures, as the recipe is a repeat from a previous posting. Living in Florida we grill out all year round. 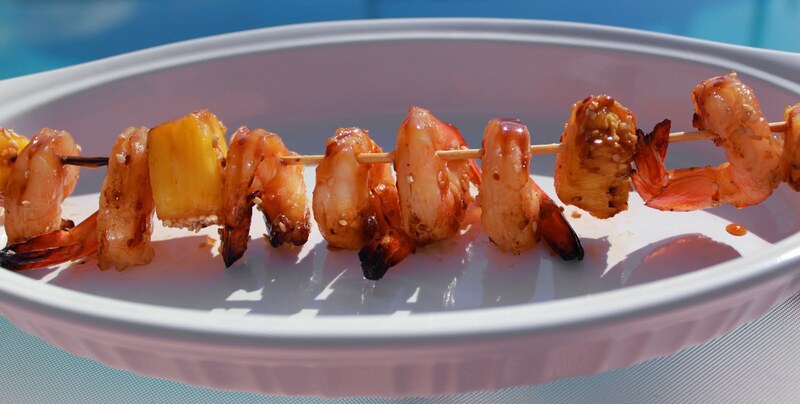 This is one quick way to make some perfectly grilled shrimp that everyone will love. I use the same basic sauce from my Chicken Teriyaki Marinade. These are extra large size shrimps. With a sweet sesame glaze, you can use this same marinade for chicken, pork and shrimp. Adding the fresh pineapple while marinating is the perfect sweetness to enhance the flavors of the sauce for these shrimps. Just cook up some boiled plain rice and your good to go..... add a bed of greens, a glass of white wine and you got a great easy meal. These cook quickly, turning once. I usually grill the shrimp until they start to turn pink and the edges are browned. For the marinade recipe please just click here and follow the recipe for Sesame Chicken Teriyaki Over White Rice. My jaw just dropped open! I knew you had grown kids but you definitely don't look like you were born in the 50's! What a horror story - I would of asked/yelled for the gas mask! I hope your feeling better. So sorry about your teeth and all that stuff you had to go through! I hate dentists, I had to deal with a few crooks! But at least you compensated that frustration with that lovely recipe! Love those gorgeous shrimps! And I agree w/ cinnamon girl, I told you, you don't look like you were born in the 50s more so in the 70s! Growing up in former Soviet Union in the 80s was the same thing - lack of fluoride for me as well :( I hope you'll be feeling better very soon! The shrimp & pineapple kebabs look terrific! sorry for your teeth,claudia!the shrimps looks amazing...grill out all year long...i have here 5-6 month only for this! Sorry to hear about the dentist. 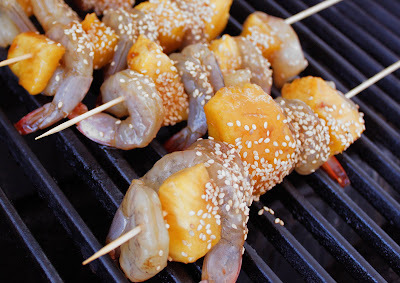 We love grilled shrimp and pineapple, great marinade recipe! I'm so sorry about your dental situation! I'm totally terrified of the dentist! This shrimp sounds really delicious! I'm totally on your side about dentist. I like them and yet dislike them! I have been visiting my dentist 'too often' lately with some gum problem. I never like the visit. I always go early, sit and read some of my best cookbooks with beautiful pictures to take my mind away. I do hope you are feeling better now, Claudia. Thanks very much for sharing with us your lovely prawns kebabs.....my favourite! So sorry you had to go through all that horror Claudia! Hope you're feeling much better now :) Love the kebab but then I guess you know I love shrimp however, whenever! Beautiful shrimp, but more importantly I hope you feel better! The dentist can really be a pain. Hope everything goes okay and you are on your road to recovery! That is one super recipe. As for the dentist and teeth woes, I'm right with you. My teeth came in early as a child and I have soft teeth. I have had at LEAST as many root canals as you (probably more) and I think just about every tooth in my mouth has a filling (thank goodness they aren't silver any more!). But I NEVER have suffered like you must have with the lack of numbing. I feel so bad for you - as if the tooth pain, then the rc, wasn't bad enough. Still - worse part is over. The tooth will heal this time and it will be another story to tell. Maybe you can come up with some delicious smoothies while your chewing ability is incapacitated. Me, too. Dislike intensely going to the dentist. Suffer and rewarded with root canals, missing teeth and pain. However, I would suffer through all for the shrimp-pineapple kebabs - they are wonderful. Oh my, the dentist should have sent you to an oral surgeon so you could have at least been put under. You poor lady...I'm so sorry about your tooth troubles. I cannot believe you weren't born in the 70's as you look amazing! So lovely. These shrimp kebobs would make anyone feel better. Take care, my friend. Hey Claudia, this shrimp looks delicious, but onto more dreadful issues (smile). I just had a root canal. Went back to the dentist to get a filling, which they stopped in the middle of and said they think it should also be a root canal. I have an appt. on may 10 to have the crown finally put on, ugh! I feel for you. This has been a dreadful and expensive experience for me (2 root canals in 6 week period). Hope nothing else happens to you for a long time in this arena! Well you already know my thoughts on how young you look! (You movie star girl.) My mom used to have problems with not getting numb at the dentist too, I wonder what's up with that? I am so sorry but I think you are feeling a bit better by now? Only you would cook a bunch of beautiful food for your family ahead of time - I would be like, "I'm going to the dentist, somebody better get me some dinner, stat!" lol. Oh man! So sorry about your tooth. That's the pits! But these kabobs are amazing and just in time for the spring/summer. I'm so sorry about what you're experiencing! I hate dentists too when I was a kid. I still remember my mom took me to a dentist for check up when I was 7. I got panic when I saw them switch on the light facing me & those horror sound inside the room. I quickly slipped through the chair and ran off from the room. OMG, that is so embrassing! hahaha.... I'll laugh when I thought of that sometimes! haha... Btw, your grilled shrimps with pineapple sounds really tempting. Oh, I just the combination between the two. Thanks.